Magnum is to launch a new membership scheme for bloggers, with a peculiar way to fight against copyright infringement, reveals the British Journal of Photography. "There is no point trying to protect ourselves from the sea with sandcastles", says Clément Saccomani, Magnum's editorial director in Paris. So they thought of another way. This new initiative will be launched in 6 months, and its goal is to build a community of supporters of Magnum's work - but of supporters ready to pay for it. For this new membership scheme will cost money: "We will ask [the bloggers] to pay between $20 and $40 [a year] to be a part of this membership, and in return they will receive discounts on books, they will be able to participate in dedicated events, they will receive signed books at the price of non-signed ones, they will be able to participate in portfolio reviews, or receive a call from one of our photographers. They will belong to a sort of 'Friends of Magnum' group and will have access to a series of benefits. Some of them will be physical, others virtual", says Massimo Moggi, Magnum's head of licensing and technology in New York. Magnum shows, once again, that it is open to change and that is first love is photography. Last year, when the agency unveiled its brand new website, all were surprised that the photographs were available to download in 900px wide. Clément Saccomani tells BJP: "If you right-click on them, you can download them. When I was talking with Chris Anderson and Jonas Bendiksen, they were telling me that if visitors just wanted to print an image and put it on their fridge, they could do it." Magnum now takes a big step in the copyright infringement war. They hope the conversion rate will be around 20-30% of the bloggers they contact to offer the scheme. This figure seems optimistic, but it is sure that Magnum will generate a certain revenue with this membership. I do think that bloggers tend to know more and more about copyright issues - and this is particularly true in the art and photography domains, where this question is very often debated. Moreover, the recent successes of paid subscriptions such as Spotify show that there is an interest in legal solutions. WHAT ARE THE SOLUTIONS AVAILABLE TODAY? Do not care about the copyright problem. This solution will, without a doubt, lead to enormous problems and shameless thefts. As an author myself, I'd consider this choice disgusting. Make examples. This is today's solution of choice: some random people get caught and pay huge amounts to big companies which consider them as thieves. This solution is proven useless today, as it does not stop the phenomenon and it diabolizes internet users. Creative Commons. Doesn't work. Period. Cooperate. Why not considering the internet users as a real force and as a potential source of profit? If you think this way, now may be a good time to find a respectful solution. Copyright infringements are bad. But downloading, copy-pasting is so easy, fast and convenient. What could be the reasons that would bring bloggers to change the way they work? A reasonable access and usage of the copyrighted material. This means that the photographs, sounds or artworks need to be available from anywhere, in different formats. This also means that the user will not use the art for wrong uses - typically, this would exclude any commercial use. A reasonable price. Don't expect too many people to be ready to pay too much for something they're doing for free today - however illegally. A mutual respect of the works. The user cares enough to actually pay for the work. His work should be recognised. I am delighted to hear this news, and think that these initiatives must be followed. Magnum seems to comply with all the criteria we just set; hence, this paid membership could be a viable and profitable solution. Icing on the cake, BJP mentions Abbas saying that Magnum would consider the use of their images by individual bloggers "legitimate." This means that Magnum agency will offer the membership to bloggers... but not persecute those who use their image outside this scheme. Magnum officials, who seem very proud of their 800,000 followers on social medias, realize where these followers come from: "illegal" publication of the world's most famous images, hosted by the agency. Magnum's CEO Giorgio Psacharopulo used a peculiar word to describe the agency, in the phrase "It allows us to interact directly with a community of people interested in our brand." So, is Magnum really a brand? 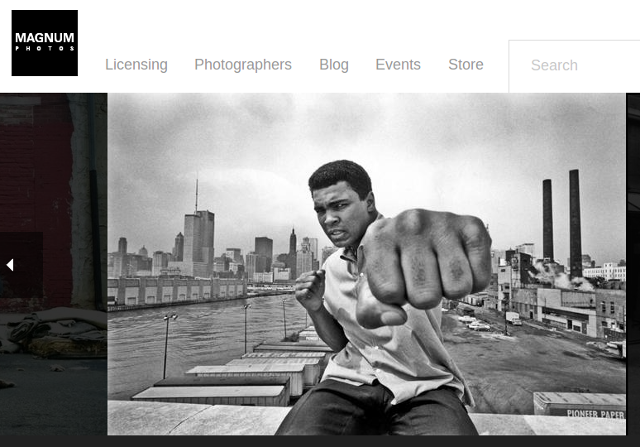 Do the recent changes in the photo industry made the 66 year-old agency turn into a 'brand'?